An image of the Virgin Mary mourning her Son's suffering. With her hands joined in prayer, she weeps for Christ and for his intercession on behalf of believers. In this case, the believer is Carlos V.
The affective power of Titian's painting derives in part from its naturalism, the mimetic conviction of painterly construction - but that conviction requires as well the shaping force of the imagination. More than impressive imitations of nature's forms - specifically, of the human body - Titian's figures, like his landscapes, also embody the animation of natural processes; the flesh itself may quiver with life, as Dolce observed, but beneath those surfaces one feels ultimately the soul or psyche of the fictive character. A commonplace of Renaissance artistic thought declared that the expressions of the face and the movements of the body were merely the outward signs of an inner life. Titian's tonalism accordingly must be read affectively as well as formally; shadows not only draw us into the physical realms - imagined rather than fully perceived visually - but they also suggest dimensions of psychic experience that can only be comprehended intuitively. 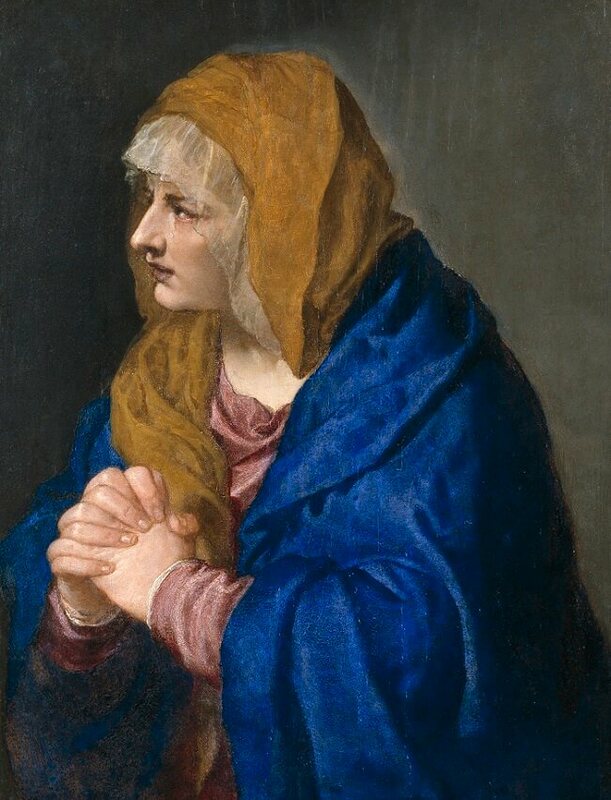 When Titian's figures are brought together their individual presences interact in such a way that the image of their encounter is more than simply a sum of its psychological parts but functions on an entirely new level of complexity - a phenomenon subtly evident in portraits Mater Dolorosa.